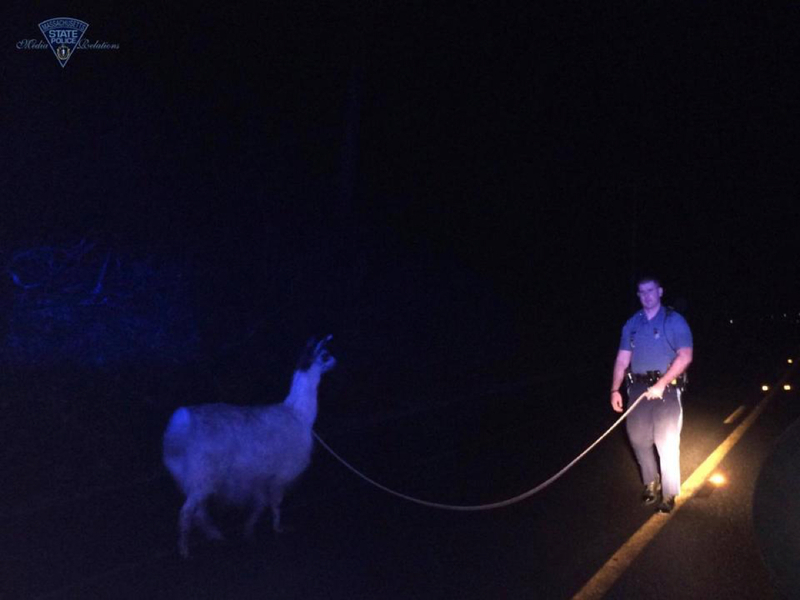 State Troopers Lasso Rogue Llama in Western Mass. By Kyle Scott Clauss·	 4/28/2017, 10:09 a.m. While there was no high-speed chase drawing national attention, as was the case in Arizona two years ago, two state troopers in Western Mass. helped guide a wayward llama to safety—and in true cowboy fashion. Just before 1 a.m. Friday, Troopers Matthew Kane and Kyle Minnicucci from the State Police barracks in Russell responded to a report of a llama wandering around on Route 23, police said. Unable to find the llama’s home and worried the llama could be struck by an oncoming vehicle, Kane fashioned a lasso from rope found in his cruiser, and successfully lassoed the unidentified llama, police said. Carrie Cruse, a local horse farm owner, met the troopers at 2:30 a.m. and loaded the languishing llama into her horse trailer. Cruse offered to keep the animal at her farm until its owner is found. “File this under, something you don’t see everyday!” State Police posted on Facebook.